FLOYD MAYWEATHER: "I THOUGHT ABOUT FIGHTING IN FEBRUARY ACTUALLY...I'M READY TO GET BACK IN THERE"
"May 5th is a date that we talked about, but let me clear the record up. I thought about fighting in February actually. May 5th is still the date that we believe we're going to fight on, but I would love to fight in February if it's possible," stated undefeated pound-for-pound champion Floyd Mayweather, who informed FightHype.com that he's already looking forward to getting back into the ring and staying much more active than he's been in the past. Ever since his 4th-round knockout of Victor Ortiz back on September 17, Mayweather has been traveling across the country on his Victory Tour spending time getting closer to his fans. 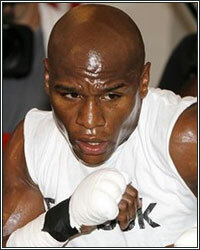 With the holiday season and the new year fast approaching, Mayweather is eager to get back to doing what he does best. "You know, I just want to stay active and stay busy because the fans said they want me to stay active and stay busy. I'm ready to get back in there and fight in February," Mayweather explained, sounding rejuvenated, energized, and ready to once again put his skills back on display as soon as possible. While he already has the MGM Grand on hold for a tentatively scheduled May 5 return, Mayweather made it clear that he's strongly considering returning sooner than expected. "When you heard that from Leonard Ellerbe, it's not wrong by saying that May 5th is the date that we chose, but my date, this is me speaking now, my date is February. If not February, then May," he continued. As for Saturday's clash between Manny Pacquiao and Juan Manuel Marquez, although he didn't watch the fight, Mayweather did hear reports about the controversial decision. "From what I'm hearing, Marquez got cheated," he added, and you won't want to miss what else he had to say.